The new City Council Speaker Melissa Mark-Viverito, Brooklyn Borough President Eric Adams, City Councilmembers Brad Lander, David Greenfield & Chaim Deutsch, State Assemblyman David Weprin, and a representative of Mayor Bill DeBlasio were just some of the heavyweights that packed into the dining room of Ezra Friedlander, CEO of The Friedlander Group, to celebrate Tu B'Shevat - a holiday celebrating trees, fruits and rebirth, also called the New Year for Trees. The program was officiated by Rabbi Steven Burg of the Simon Wiesenthal Center. 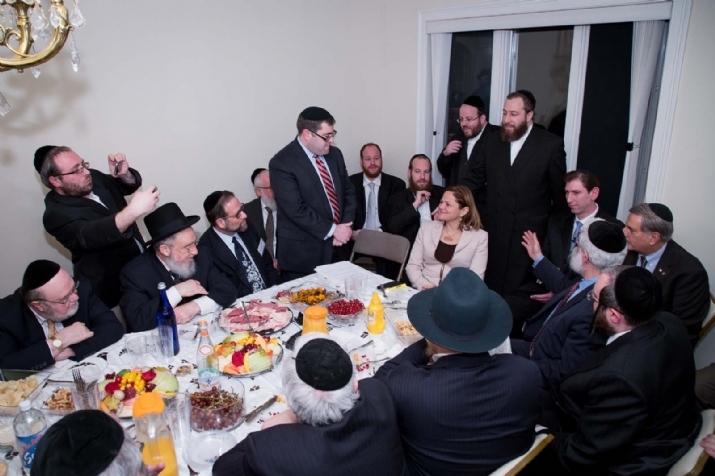 Mark-Viverito visited Boro Park Wednesday, January 15,2014 for the first time since elected as speaker on January 8th. The speaker attended the annual Tu B'Shvat seder at the home of Ezra Friedlander, CEO of The Friedlander Group, along with the Jewish community's three Council members - David Greenfield, Brad Lander (who was the leading force behind Ms. Mark-Viverito's candidacy for the Speakership) and Chaim Deutsch - and various government representatives, community leaders and activists. "They're part of the community. They work for the community. They represent the community. So it's only natural to welcome them, that we celebrate the holiday together and we thank them for what they're doing on our behalf," Friedlander said. "It's one little family." It was the second year in a row Friedlander held the party allowing prominent members of the city's Orthodox Jewish community to mingle with elected officials. "I was invited and obviously I have colleagues that are here. There are a lot of important leaders here," said Council Speaker Mark-Viverito. "My responsibility and role is to build relationships and to really learn about other communities and other cultures." The Speaker, for her part, joked as she compared herself to one of the fruit on the table - Sabras (prickly pear fruit), as having the image of a tough woman but with a soft part from inside. (The Sabra fruit is thorny on the outside with a thick peel that must be removed, to get to the sweet soft meaty inside). Ms. Mark-Viverito spoke of the need to work together in eliminating any type of racism, bigotry and any type of violence in the City of New York. "One of the wonderful things about living in New York, is that you're able to travel, and if you make a commitment and really want to learn, and learn about other people's cultures and understand each other. You break down some of that anger and ignorance that leads sometimes to hatred," she said. The Speaker said that the relationships she has managed to build over the years in government with the community has made her a better person and a better legislator, and is an example for others. "We need to make an effort to reach across and learn from each other's experiences and cultures," she stated. "Being a Latina, and understanding that a lot of times people are not understanding me - who I am and who I represent - I know the importance of reaching across." Brooklyn Borough President Eric Adams also highlighted the event, noting that this marks his first joyous Jewish event since entering Borough Hall. "It was very appropriate to welcome Speaker Melissa-Mark Viverito and Brooklyn Borough President Eric Adams on Tu B'shvat which is known as Rosh Hashanah for the trees with their own recent oath of office which is symbolic of a fresh start to our borough and city," said Ezra Friedlander. Read coverage and see more photos on COLLive. Watch more video footage on JPUpdates.